Why Should You Need To Sharpen A Chainsaw? A well maintained chainsaw is going to give you good service for many years. Like any other tool, chainsaws also wear out and need to be regularly maintained in order to remain in good working conditions. Not only is it safer to use, a well sharpened chainsaw is also more efficient as it gets a lot more done work in a shorter time. A saw chain is made up of cutters, which are designed to cut and depth gauges which control and determine the depth of the cut. These parts need to be sharp in order to be effective and this is why they should be sharpened whenever they wear out and become dull or blunt. Using a blunt or poorly sharpened chainsaw can be very frustrating and the chainsaw operator may become fatigued and fail to focus on the task at hand. Dull chainsaws are also more prone to kickback which are the main cause of chainsaw accidents. When It’s Time To Re-Sharpened Your Chain? For a chainsaw to work efficiently, the height of the rakers or the depth gauges needs to be slightly less than the height of the cutters. This difference is very important because if it is too small, the cutters will keep sliding over the wood without actually cutting and if it is too much, the saw will become very jumpy and unstable. This is dangerous and poses a risk to the chainsaw operator. So how do you know if your chainsaw needs to be re-sharpened? Below are some signs that will tell you when your saw chain has become dull and is due for re-sharpening. When cutting through wood, sharp chainsaws produce wood chips. If your chainsaw is producing fine saw dust instead, it is most probably dull and needs to be re-sharpened. When the chainsaw is blunt, it means that the rakers and the cutters are not working well. Your saw will begin jumping erratically because the saw chains slide and bounce over the wood instead of cutting through. The saw will also start making irregular cuts. If your chainsaw begins behaving this way, you need to stop and re-sharpen it because continued use could cause accidents. A well sharpened chainsaw should cut through wood without application of force. If you realize that you are using a lot of energy to cut wood using a chainsaw, your chainsaw is dull. A sharp chainsaw is fast, efficient, safer and a lot easier to use. If you are not familiar with prolonged chainsaw use, this can be very frustrating. If you want to save time, energy and ultimately your saw, sharpening the chain is a very big part of using it. We have gotten to the bottom of best practices on how to sharpen a chainsaw and hope it will keep you cutting and trimming faster and easier than ever before. These provisions are relatively cheap, though they are just as important as the saw itself and cannot be overlooked. You can opt for electrical saw sharpeners or special products that make sharpening your saw less of an inconvenience, but for the basic task of sharpening a saw, you will usually need these three standard ingredients as minimum requirements. A chainsaw file is a round file that fits in the teeth of the saw chain. There are a variety of sizes of files available. Make sure you have the correct gauge file for your chain. If you are not sure which one to buy or use, you can check the model number of your saw on the manufacturer’s documentation or website or the reference book where you buy your file. While this seems complicated, it is probably the most difficult part of sharpening your saw. Please make sure you confirm that you are using the right size file for your chain otherwise all your work will have been for nothing. Pro Tip: Files should sit in the chain snugly, but a quarter of its diameter should rise above the chain. The chainsaw wrench is a combination of two size wrenches and a flat head screwdriver. If you have one of these wrenches that fits your saw it can save time when sharpening. Of course, you can opt for just a good fitting wrench or socket and a separate screwdriver if you are missing one. Pro Tip: Some chainsaws now feature bar adjustment systems that make the saw wrench obsolete. The majority of chainsaws still require some tools for bar adjustment. As you saw with the chainsaw the chain will likely loosen up. Simply use the saw wrench to adjust the tightness of the chain. The first adjusts the chain using the wrench to loosen the chainsaw bar. The bar is what they call the blade shaped part of the saw that the chain runs on. Usually, there are two nuts holding the bar to the rest of the saw. They are usually easily accessible from the outside. Once loose, there is a screw alongside the bar that will adjust the tension on the chain. Tighten the screw to take the slack out of the chain to allow for a more stable saw and easier sharpening. The correct starting point for sharpening on a saw chain is where there are two cutting corners facing the same direction. To identify what part of the chain is a cutting corner. Find the spot on the chain you are working on that has two cutting corners in a row that are facing the same direction. Make sure you can safely spin the chain on the bar by hand and look at the links to find the correct starting position. Pro Tip: While this is not technically necessary for sharpening a chain, starting and stopping on the same link is important for ensuring you get a consistent cutting edge on the entire chain. You can also mark the starting tooth with a felt tip marker as a reference. When filing the cutting corners, the file will fit in the chain snugly when you find the correct position for the file. You will simply be filing a sharp edge onto the already fairly sharp part of the chain. Keep the file level when running across the chain. Don’t angle it up or down. Use the same number of strokes with the file for each link. It usually takes eight to 20 strokes for each link. Keep the file pointed forward at about a 30 degree angle for each cutting corner. Twist the file a half turn on each stroke so that you are grinding out the link as well as filing it. Pro Tip: Every cutting corner faces in the opposite direction of the last one. You will have to either sharpen every other link and then switch directions, or switch directions for every link. Depth gauge tool – this tool helps keep the chain cutting at a consistent depth so cutting corners don’t wear unevenly. You simply check the depth with the tool and file the teeth with a special flat file. File guide – These file attachments are relatively cheap and offer a visual guide to keep you filing at a perfect 30 degree angle. 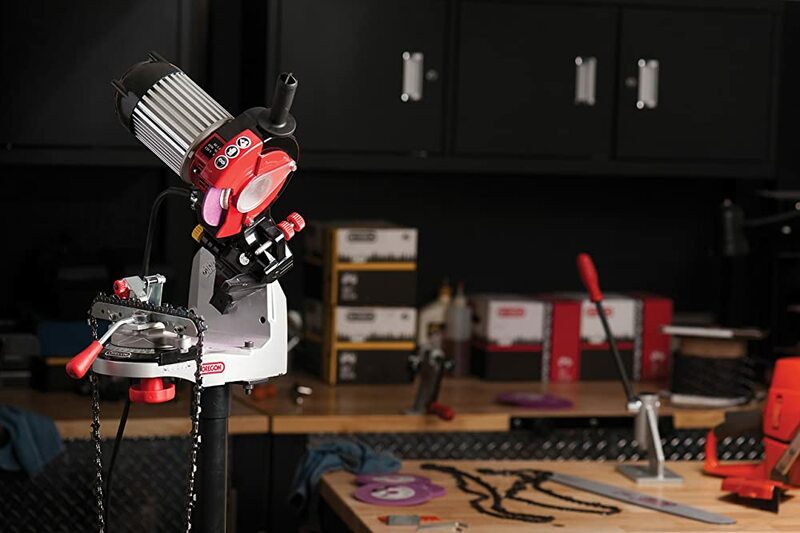 Sharpening vise – holds the saw by the bar so the saw is steady while you work on the chain. This can be a great alternative to leaning over the saw and trying to hold it steady while you work. 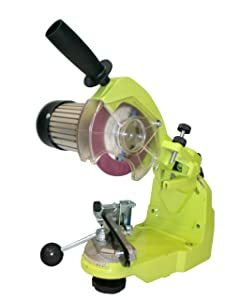 Electric sharpeners – no more manual filing with these special grinders. You can plug them into the wall or hook them up to your car battery to take all the work out of chainsaw sharpening. That’s it. We must say, however, that knowing how to sharpen a chainsaw makes all the difference when cutting. You will surely notice a huge difference if you follow these steps. What’s The Best Method To Sharpen A Chainsaw? A dull chainsaw is not only inefficient and time-consuming but also very dangerous as it increases the risk of kickback. While some chainsaws come with a self-sharpening system. However, most do not come with this feature and need to be sharpened from time to time when they become blunt to keep them working in the best conditions. When your chainsaw’s saw chain becomes blunt, you can either take it to be sharpened at your favorite chainsaw service center for a fee or sharpen it on your own. Although many people view sharpening a chainsaw as a very complicated exercise, it is actually an easy task that you can complete in an afternoon. Learning to sharpen your own chainsaw not only saves you the frequent trips to a chainsaw to the chainsaw service center but also saves your money. There are several methods used to sharpen saw chains. While some chainsaw users prefer sharpening their blunt chains by hand using a hand file, others prefer using machines. Others use both the machines and the hand file to complete the task. 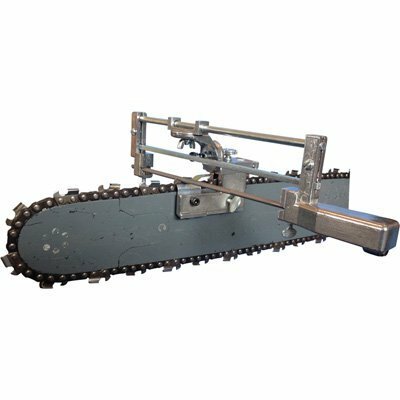 Below are some of the several methods commonly used by chainsaw users to sharpen their blunt saw chains. Saw chains become dull pretty quickly and need to be re-sharpened frequently in order to keep them sharp so that they can keep working efficiently. The best thing about taking your chainsaw to be sharpened by a professional chainsaw service dealer is that the saw chain becomes sharp as new. However, this also depends on the operators experience and ability in using the machine. A professional will most certainly sharpen even the dullest chains to be as sharp as new. Better consistency and a decreased chance of improper sharpening which may lead to uneven cutter length. A professional chainsaw sharpener will be able to sharpen a chain according to its manufacturer specifications. If the operator is not conversant with the machine, you may find that a lot of metal is removed from the saw chain during the sharpening process. This wears out the chain all too soon. It is also quite expensive especially as saw chains become dull very quickly and also inconvenient as you will have to make a trip to the chainsaw service store. You may also have to wait a few days to get your saw chain. This method is only suitable for homeowners and occasional chainsaw users who may only need this service a few times each year and may not have to make frequent trips to the chainsaw sharpening store. This method refers to manually sharpening a saw chain using a hand-held file to sharpen the cutters and the depth gauges of the chain. The guide bar is held in place by a vise-grip as the chain’s teeth are sharpened each at a time. This ensures that the angle kept is consistent at all times. This method is inexpensive in that you do not have to spend any money apart from purchasing the file. It is also relatively fast as it can be done in less than an hour and does not limit you in that you can sharpen your chainsaw anywhere you choose to. The best thing about this method that it is friendly to the chain as it removes the least amount of metal from it during the sharpening which means that your chainsaw will last longer. It requires skill. Sometimes maintaining accurate angles is quite difficult and may result in uneven sharpening which is dangerous as it may increase the chance of accidents. Best for chainsaw users who have experience using this sharpening method. When using a Dremel tool to sharpen your saw chain, it is essential to understand the sizes of the stones and what size is suitable for your chain. The sizing is crucial in sharpening a saw chain correctly and successfully. A Dremel tool works faster than using a hand-held file especially with very blunt tools. You can sharpen your saw chain and use it in under five minutes. 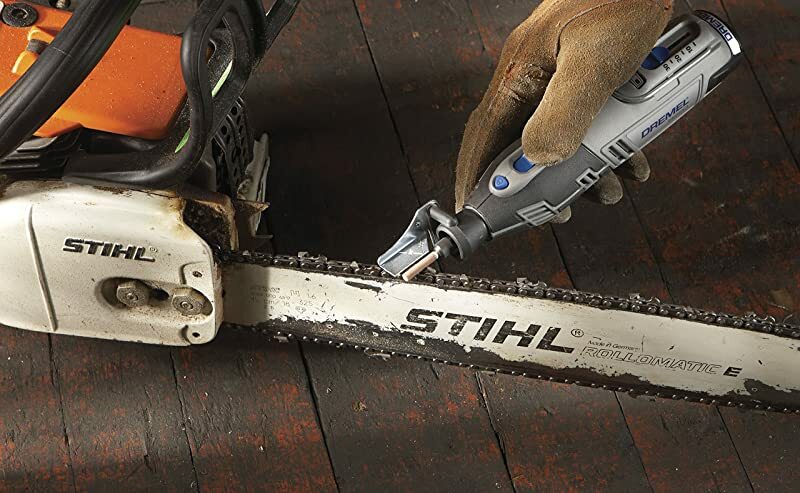 With cordless Dremel attachments, you also don’t have to remove the chain from the chainsaw in order to sharpen it. Dremel tools and stones are quite expensive and are often not durable. There is a risk of applying too much heat to a tooth and damaging it. Maintaining angle consistency takes a lot of practice and is bound to be difficult for a beginner or new chainsaw user. There are various types of automated chainsaw sharpeners that are available in the market. They include cordless and corded electric chainsaw sharpeners. These tools are very handy especially for professional chainsaw users and occasional users who use their chainsaws for heavy tasks and thus go through a lot of saw chains throughout the year. A chainsaw sharpener is easy to use, fast and enables you to consistently maintain accurate angles when sharpening your saw chains. These machines often remove too much metal from the chains teeth and may reduce the life of your saw chain. Like Dremel tools, it is easy to use too much heat and damage the teeth of the saw chain. What method is best will obviously depend on the preferences of each specific chainsaw user. Even though using an automated sharpener is fast and easy to use, some chainsaw users still prefer using a hand-held file to sharpen their chainsaws saw chains. If you are a new chainsaw user looking for a chainsaw sharpener, you can easily get overwhelmed by the various options available. The following list comprises simple and brief reviews of the top rated chainsaw sharpeners. I hope it will help you find a method and a tool that is most suitable for your needs. Like most electric chainsaw sharpeners, the Timber Tuff is easy to operate even for an inexperienced chainsaw user. 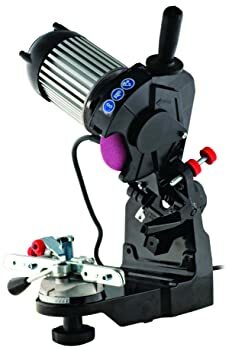 The machine is fitted with grinding blades for 3/16-inch, 1/4 and 1/8 separately and comes with a free work light and a transparent safety shield. Built with a capacity to reach 3600rpm/100V and an ability to produce a noise level of 70db with light 15w, this chainsaw sharpener is not only fast, it is also very quiet and convenient even when you live in a residential area or want to sharpen your chainsaw indoors. The Timber Tuff is also designed to be very flexible in that it can easily be mount on any working surface be it a bench or a wall. The only downsides are that this sharpener is not very solid and thus not easily portable. You must take extra care when carrying it around to avoid breaking or dismantling it. It also has to be connected to power source and this limits its use. This electric sharpener is also very stable, fast and quite easy to use. It is built to reach a speed of 4200rpm/ 120v and can be plugged to any standard 120v power outlet. Like the Timber Tuff, this sharpener is also can also be mounted on the wall, a bench and any work surface. It is also very stable making it easy to use for the operator. The Buffalo Tools ECSS is also designed to adjust to most popular chain designs and thus is also perfect for professional chainsaw users who often use different chain types and chain sizes. It can also be used by homeowners as it also produces minimum sound and can conveniently be used inside the house or even in residential areas. The Granberg Bar Mount Chain Sharpener is very popular with chainsaw sharpeners. It is designed with the ability to sharpen most chain pitches and once you add file, it can easily mount onto the chain bar. With this chain sharpener, you can easily control the file size by the gauge and pitch of the being sharpened. It is built with a Kevlar reinforced drive belt, high speed micro ball bearings and a heat-resistant poly-carbonate case. This makes it strong, unaffected by heat and able to sharpen saw chains fast without damaging the teeth. With this original chain sharpener from Granberg, you will be able to get more accurate sharpening angles and grinding depths because it is built with very flexible thumb nuts and knobs. 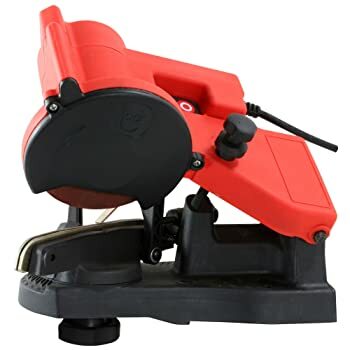 Built with a speed capacity of 3400rpm/115v and fitted with three grinding wheels; 1/4-inch , 1/8-inch and 3/16 inches respectively, the Oregon 511AX chain sharpener is designed to sharpen ¼ inch, 0.325-inch, ½ inch and ¾ inch pitch chains. 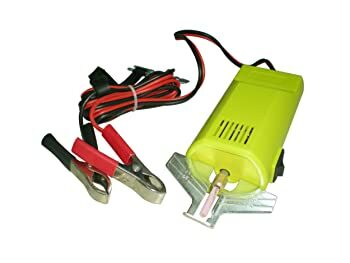 This electric sharpener is also very stable, compact and hence highly portable. This makes it especially perfect for chainsaw users who are always on the go. It also comes with a wheel-dressing brick and template which is designed for setting the depth-gauges and wheel curves hence enabling you to sharpen angles without adjustments and new tuning abilities for precise grinds as the wheel wears. It is fast, versatile and easy to use. Unlike other sharpeners which may not be very stable, this sharpener is compact and can be carried around easily with no risk of breaking or dismantling its set up. It is quite expensive but it is a professional sharpener that you will get a high-quality machine for value money. The Timber Tuff CS-12V potable electric chainsaw is built with a high speed motor no-load speed of 12v/200001000;P1, 17W and a high efficiency point of 16000500/minute;P040W which makes it fast and very efficient in sharpening different kinds of chainsaws with varying pitches. The sharpener is also built with a protective anti-aging and anti-impact PC material cover that keeps it looking and working as good as new for longer. It is also stays cool and its temperatures range between 20 degrees, 25 degrees and 30 degrees at random. This portable sharpener has also received many positive reviews from many chainsaw users who praise its versatility and ability to sharpen a dull saw chain and bring it to knife-edge sharp condition in a very short time. This sharpener is suitable for all types of chainsaw users and perfect especially for those chainsaw users who move around because it is designed to be highly portable. The A679-02 Dremel sharpening kit is designed to easily sharpen blunt saw chain blades and a wide range of other outdoor tools. Together with an instruction manual, this kit comes with garden tool sharpening attachment, lawn mower sharpening attachment, gauge, insertions, a wrench, and 4 sharpening stones (453, 454, 455 and 932). It is therefore a multi-purpose tool that you can use to maintain all your outdoor tools keeping them sharp and efficient. The kit is designed to be compatible with all corded electric rotary tools and even some battery-powered tools. This chain sharpening kit includes 1 assembled file frame, 2 wooden handles two files (1 round and 1 flat), a .025 drop center depth gauge tool and 5/32 –inch File Diameter. It is fast and very efficient enabling you to sharpen both sides of your chainsaw in less than 20 minutes. It is also reasonably priced and very easy to grasp and use even for a beginner with no chain sharpening experience. It has comfortable handles that makes it easy to grip and use and gives you power over blade sharpness and sharpening angles. 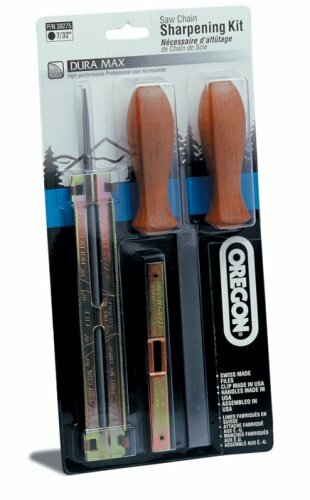 This Oregon sharpening kit has received many positive online reviews from many chainsaw users for its quality, ease of you, sharpening capabilities and value for money. 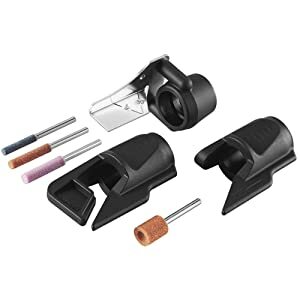 When using this sharpening kit however, you should be careful not to break the handle given that it is made of wood and hence may be easily breakable. This Husqvarna chainsaw blade file kit comes with a file handle, a combination filing gauge and, 3 files (2 round and 1 flat). The flat file is designed for the depth gauges whereas the combination gauge is very essential in ensuring the correct filing angle. This simplifies the saw chain sharpening process. This kit is designed for a wide range of chain models including 340, 345, 346XP, 350, 351 and 353 and therefore very versatile. It is also very affordable and it has an excellent handle that provides ease of use to the user. This kit has garnered very numerous positive online reviews from chainsaw users most of who praise it for its quality, excellent sharpening ability, and very easy to use once you understand how to set it up. Although some users say the instructions are not clear enough, there are useful YouTube videos you can check out if you do not know how to set it up and use. You should however ensure that you order the correct size file kit for your chain size. Like most products from this brand, this kit is excellent. Built with durable high quality Machined Aluminum and an ability to sharpen each chain tooth to a precise same length and angle in seconds. The timberline chainsaw sharpener is a great product designed for both professional users and the average homeowner. It is easy to use and also very portable making suitable for chainsaw users who move around. This sharpener is also very flexible and can be used virtually on all chainsaws. It is, fast, easy to use and very efficient. This timberline sharpener has also received many positive online reviews from customers for its quality, efficiency and durability. It is a bit pricey for the occasional chainsaw user who only uses a chainsaw a few times each year but a great chainsaw sharpener nonetheless if you can comfortably afford it. 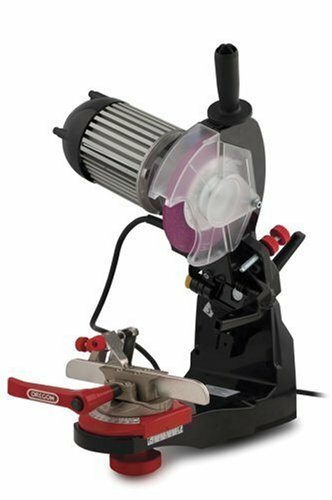 The Oregon 510A Bench Chain Grinder is a well-built tool fitted with excellent features that allows ease of use to the operator as well as fast and efficient chain sharpening. It has 3400rpm/ 110v, .38 Horsepower and direct drive motor with one-way motor revolution. It also has specially designed handles and dials that provide the user with a good grip as well a dressing Brick, 5-3/4 dia. X 1/8 inches, 5-3/4″ dia. X 3/16- inch and 5-3/4″ dia. X ¼ inch thick grinding wheels (for depth-gauges) and a template whose function is to check the depth gauge, the wheel contour and chain size. This sharpener has also received a lot online reviews from chainsaw users for its quality, being easy to set up and use and its fast and excellent sharpening capabilities. While some users find the grinder set-up instructions to be unclear, you can check out YouTube videos that show a step-by-step guide on how to assemble the grinder and use it. It is actually quite easy to set it up and once you have understood the chain specs and how to set up the machine, you will find that it is an excellent chainsaw sharpener. It is also a bit pricey and perfect more suitable for professional chainsaw users and homeowners who use their chainsaws for heavy duty tasks and probably use a lot of saw chains throughout the year. It is perfect for anyone who uses or needs to sharpen a lot of saw chains. The term best chainsaw sharpener is relative. This is because, different chainsaw users have different preferences and what may be best for one may not work for another. When choosing a chainsaw sharpener, there are factors that you should consider before settling for any one tool. 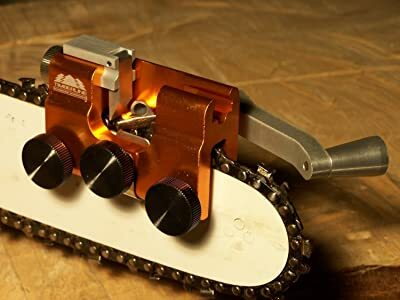 All the available options come at various prices and you can choose a chain sharpener based on how much you are willing or can comfortably spend to purchase it. Obviously, if you use your chainsaw just a few times each year and tend to go through 2 or three chains, it would not make sense to purchase a highly expensive sharpener. 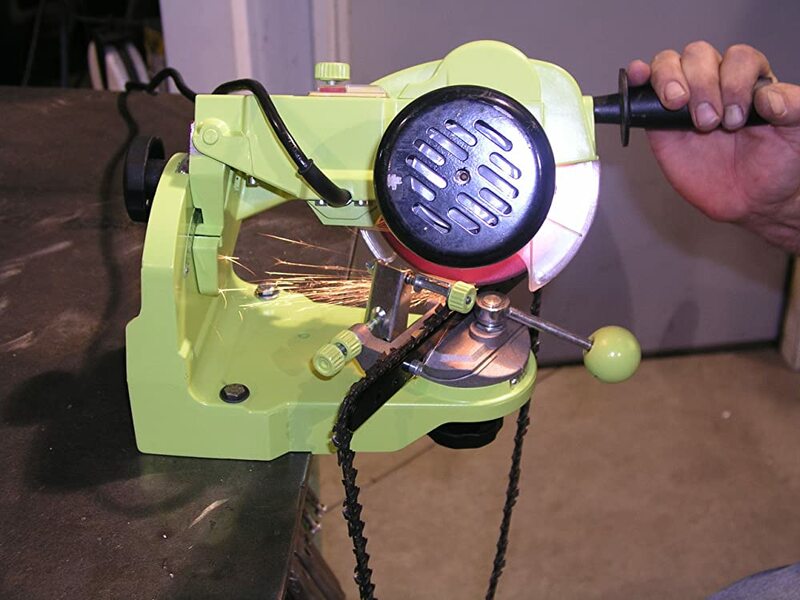 You have no prior experience with chain sharpeners; you need to choose one that is easy to use even for beginners. An easy to use the electric model or Dremel attachment can be a good option. Experienced chainsaw users know what works for them. While some chainsaw users prefer electric models, others prefer to use manual hand-held files or use both automated and manual filing methods to sharpen their chainsaws. If you are going to use your chainsaw for heavy tasks throughout the year, you will definitely be going through a lot of saw chains. Therefore makes sense to invest in a good quality chainsaw sharpener which is designed to handle frequent chain sharpening. However, if you will be using the chainsaw a few times or for light tasks, you can invest in a cheaper and simpler option like a hand-held file or a Dremel tool which is cheaper but can still sharpen a saw chain. Many chainsaw owners sometimes fail to sharpen their chainsaws in the correct manner when they become blunt. A chainsaw that is not sharpened properly makes it very difficult to line up cuts accurately which can put the operator in a highly dangerous or even tragic situation. While this task can seem very intimidating, it is actually very simple and can be completed in less than 20 minutes once you understand your chainsaw and how to sharpen it correctly. Below are some of the safety measures and guidelines that can be used by beginners or new chainsaw owners when they want to sharpen their chainsaws. Many chainsaw accidents occur because of human error. It is important to ensure that the chainsaw is mounted on a stable level surface during the sharpening otherwise; the chainsaw may slip and injure you. Any right thinking person will also not leave the chainsaw in a place where it is accessible to children knowing how dangerous the machine can be. One must always ensure that when sharpening the chainsaw, due care is observed. During the sharpening, a chainsaw can still cause injury. It is important to wear eye protectors, chaps, gloves and other recommended protective gear that will protect you from cuts and other risks. It is always better to be safe than sorry. Every chainsaw model comes with a manual that equips the user with knowledge about the chainsaw and how it should be maintained. While it will not make you a pro in maintaining and operating a chainsaw, it will equip you with some basic knowledge regarding your chainsaw. Some people buy new chains or take their chainsaws to be sharpened at a fee whenever they become blunt. Knowing how to re-sharpen your chainsaw will save you time and money. Use resin solvent to thoroughly clean the chainsaw of all grease, saw dust and particles. Also, check whether the cutters or depth gauge or any other part of the saw chain has been damaged. In case of damage, replace all the worn out parts before re-sharpening. If the wear out is too advanced and the wear marks have been reached, it is usually advisable to replace the saw chain. When sharpening a chainsaw, it is important to tension the chain tighter than usual because as this will prevent the cutters from slanting. This makes it easier to maintain correct positions or angles. The chain tension should be restored to normal when the saw chain has been re-sharpened. It is important to ensure that the files used for sharpening are appropriate for the particular chainsaw. If the files are too small or too large, they are likely to incorrectly sharpen the chain and even possibly weaken and ruin the structure that holds the chainsaw together. First place the file guide above the cutter. Then lay it on the guide and ensure that it is in line with the witness marks. Grasp the file with both hands and file from the inside out using full strokes, then apply a little pressure and let up on the return stroke. Sharpen all the cutter teeth working from the inside of the bar using a proper-sized file and gauge then tune each depth gauge to the corresponding cutter tooth also using the proper depth gauge guide and a flat file. Ensure that 20 percent of your file diameter is above the top plate at all times in order to maintain proper angles. Keeping your saw chains sharp is very important because it not only enhances safety but also ensures that the chain cuts faster and more efficiently. Although you can always take your chain to be sharpened at a chainsaw service center or buy a new one, learning to sharpen your own chainsaw is both convenient and economical because it saves you the frequent trips to the service center and you will also get to save some cash each year. When you decide to sharpen your chainsaw on your own, you will need to invest in a sharpening tool or file kit that you will use for sharpening your chains when they become blunt. There are a lot of options out there that you can choose from. The best chainsaw sharpener for you will depend on your needs and your preferences. It is advisable to do a lot of research and to know your chain pitch so that you can find one that is suitable for you. However, online reviews will make it easier for you because you will be hearing opinions of actual people who have used the products. This will help you narrow down your search and possibly help you settle on one good chain sharpener. Ultimately, the best chainsaw sharpener is one that best meets your needs and expectations. I looked through out inter net attempting to get answers on types of chains and uses. I got so frustrated I quit. In trying last time I found your page. I am very very impressed and pleased with your detail and professionalism. Thanks guys great job! !